Phillies pitcher Zach Eflin allowed just one earned run in five innings Monday against the St. Louis Cardinals in Jupiter, Fla.
JUPITER, Fla. – The Phillies made a rare trip to the east coast of Florida Sunday night, but the bus that carried the team from their spring-training home in Clearwater and across Yeehaw Junction did not include a lot of guys who you will see in Philadelphia on opening day. 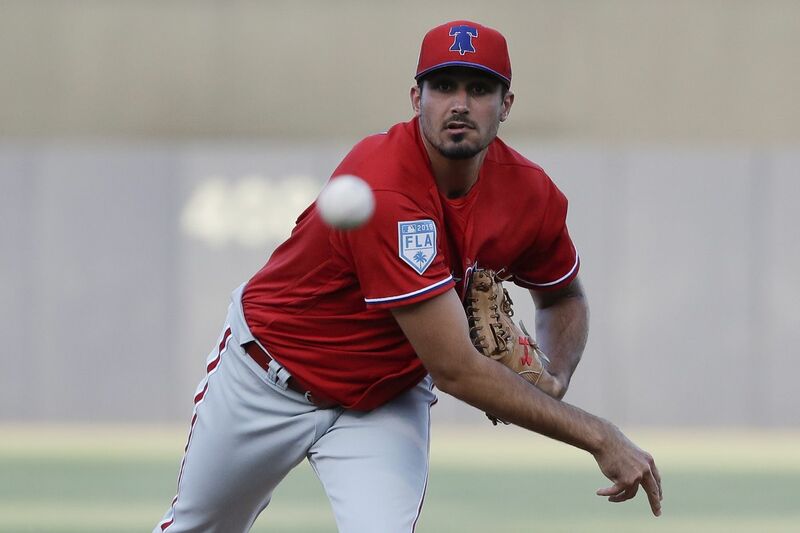 One of the few exceptions was right-hander Zach Eflin, who made his penultimate spring-training start Monday afternoon against the St. Louis Cardinals. Eflin’s outing went well enough, especially since the pitcher did not feel he was at his best. He allowed just one earned run on four hits and a walk in five innings, lowering his spring-training ERA to 2.40. “The one mistake he made was the slider to [Paul] Goldschmidt,” manager Gabe Kapler said. The fifth-inning mistake bounced off a building beyond the left-field fence for a two-run home run and it gave the Cardinals a 3-0 lead on their way to a 4-1 win. Zach Eflin, shown during a game last week, made his penultimate start in spring training on Monday. It will not be the last mistake punished by Goldschmidt this season, but the St. Louis runs were unearned because of a two-out error charged to second baseman Gregorio Petit. This is the first time in Eflin’s career he has arrived in spring training with a spot in the starting rotation pretty much assured and he believes this needs to be a defining season. He will make one more Grapefruit League start before his likely regular-season debut April 2 against the Nationals in Washington. Right fielder Bryce Harper got his first hit as a Phillie – sort of. Playing in a minor-league game against a Detroit Tigers affiliate, Harper went 2-for-4 with two singles and he also played four innings in right field. “I know he has been saying he wants to get out of spring training with at least one hit,” Kapler joked after relaying the report of Harper’s day from Clearwater. Officially, Harper is still hitless in eight at-bats with five strikeouts, but he does have four walks and was hit by a pitch, which is why his on-base percentage is 385 points higher than his batting average. Harper will not play in either a minor-league game or a big-league game Tuesday but is expected to return to the lineup and right field Wednesday in Clearwater against the big-league Tigers. Phillies right fielder Bryce Harper, shown last week, got two hits and played four innings in a minor-league game Monday in Clearwater, Fla.
Right-hander Drew Anderson is scheduled to make his fifth start of the spring Tuesday against the Houston Astros in West Palm Beach, Fla., and it will give him a chance to solidify his position as the leading candidate to get a call to the big leagues from triple-A Lehigh Valley when the season begins. Through four starts, Anderson has allowed just one run on six hits and two walks in 12 2/3 innings. With the help of a newly developed cutter, he has also struck out 12 batters. Despite Anderson’s outstanding work this spring and the struggles of Vince Velasquez (six earned runs in three innings and two starts), the Phillies’ anticipated rotation remains Aaron Nola, Jake Arrieta, Nick Pivetta, Eflin, and Velasquez. “His next start we’re going to push him a little bit,” Kapler said of Velasquez. Velasquez’s next start is scheduled for Wednesday. Asked if the Phillies would consider a four-man rotation to start the season because they have three off days in the first week, Kapler said that was not the plan. “Nothing is written in stone, but our expectation is we will have five guys make their starts the first time through,” Kapler said. That means opening-day starter Nola will have seven days of rest between his first and second starts and six days between his second and third starts.